Over 130 Giclée posters and prints. Giclée prints of the Vélo-Rétro T-shirt images printed on heavy-weight cover stock that measures approximately 13 x 19 inches in size. 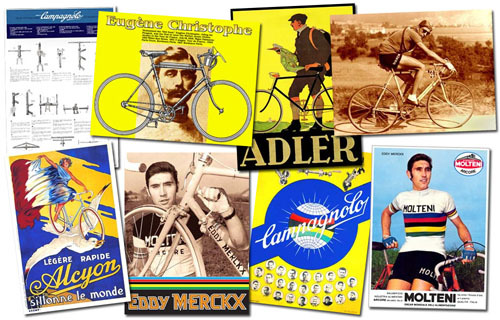 Don't see your favorite Vélo-Rétro T-shirt image here? We can print a poster of any of the T-shirt images that you see on the website. Give us a call or an email about what you would like us to make for you. Ordering: To order, click the "Add to Cart" button and you will be taken to a Secure Site: Visa, MasterCard, Discover, American Express, and PayPal credit cards are accepted. You don't need a PayPal account to pay with a credit card through PayPal; no service fee will be charged to you, it's charged to me. FOREIGN ORDERS WELCOME! New lower shipping prices! Domestic Shipping: We ship by the cheapest and most secure method and any overpayment for shipping is refunded back to you. Poster orders will be shipped in a cardboard mailing tube by USPS Standard Post ($6.45). Foreign Shipping: Shipping will be calculated AFTER you place your order and you will be contacted by email with the amount owed. We ship by the cheapest and most secure method and any overpayment for shipping is refunded back to you. Poster orders will be shipped in a cardboard mailing tube by International First Class ($8.80 to Canada or $13.65 World Wide). Below are just some of the posters and prints we offer for sale... click on thumbnails for a larger view. Team poster of Eddy Merckx' 1969 Tour de France winning team. The only time a single cyclist has won not only the general classification, but the points classification and mountains classification as well. Eddy Merckx rode on the winning team, Faema, won the combination classification and the combativity award. Epic! La Domenica from June 1950 showing the season's main competitors: the grand rivals Fausto Coppi and Gino Bartali, along with Antonio Bevilacqua, Ferdinand Kubler, Fiorenzo Magni and Jean Robic. Domenica del Corriere was an Italian weekly newspaper which ran from 1899 to 1989. It came out every Sunday free with Corriere della Sera. Illustration by the famous Italian illustrator Walter Molino (1915-1997). Team poster of Moreno Argentin's 1987 Gewiss Bianchi team. Argentin won stages in the Tour de France, the Giro d'Italia and the Tour de Suisse. Known as Il Capo ("The Boss"), he won Liege-Bastogne-Liege four times, the La Fleche Wallonne three times and the Tour of Flanders and Giro di Lombardia once. He became Italian national champion in 1983 and 1989, and world champion in 1986. MORE PRINTS? We can print a poster of most of the T-shirt images that you see on the website for $19.95. Give us a call or an email about what you would like us to make for you.